Summer reading and book report is done. Back to school shopping is done.Now the big test starts. 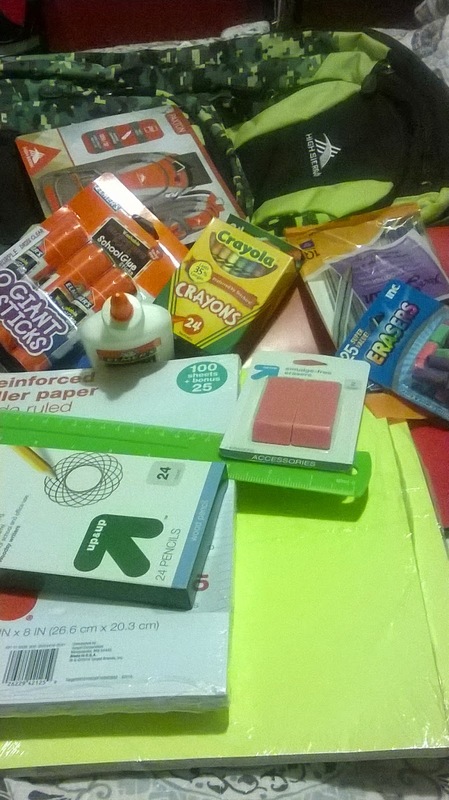 After cruising the aisles of Target and Wal-mart and the virtual aisles of Amazon, I have snag all the pencils, crayon, binder leaves, backpack and the countless supplies that my third grader needs for the upcoming school year. The uniforms are crisped and clean and ready for the beating they will take in the next ten months. As the first day of school draws closer my son is not the only one with anxiety. This had me wondering what I can do to make the school year smoother for both him and I. After two years of having the same teacher which my son believes hates him, I am actually looking forward to getting to know a new teacher and to learn if my son nonchalant behavior will change. I will do my best to relax this school year, but as all parents know that by October I will possibly be wishing for June. I have become a great logistic manager when it comes to getting him from one place to the next. However, this year his father aka assistant logistic manager has four consecutive days of school ( he is finally working on finishing his degree). I will do my best to stick to the drop off and pick up plans. Homework time is always a source of contention, so this school year I will not hover and allow him to complete his homework independently. I have resigned myself to the knowledge that I will have to buy new uniforms and shoes come January because by then they will all be a tattered mess. I know I will also be look forward to each holiday on the school schedule, so I can take a breath and not deal with traffic or homework. Wishing all parents a great school year, we will need it.